For those of you who are not familiar with the Kobe area there is a district near the water called Sanomiya, it is a mix of restaurants, shopping malls, arcades, bars, and basically all sorts of things. If you want to explore the modern part of the city this is probably the best place to go and it's about half an hour away by train from my house in Nishinomiya. Because my school is between that district and my house it means I only have to pay like 2 dollars for a round trip to go there and since I've been so busy getting used to Japan this was the first time I've had a chance to go with my friends. Since there were so many of us the originally planned time of noon turned into around 2 but that is to be expected with a big group lol. In the end we finally made our way to the local arcade where I could finally check out the game I was looking forward to seeing. 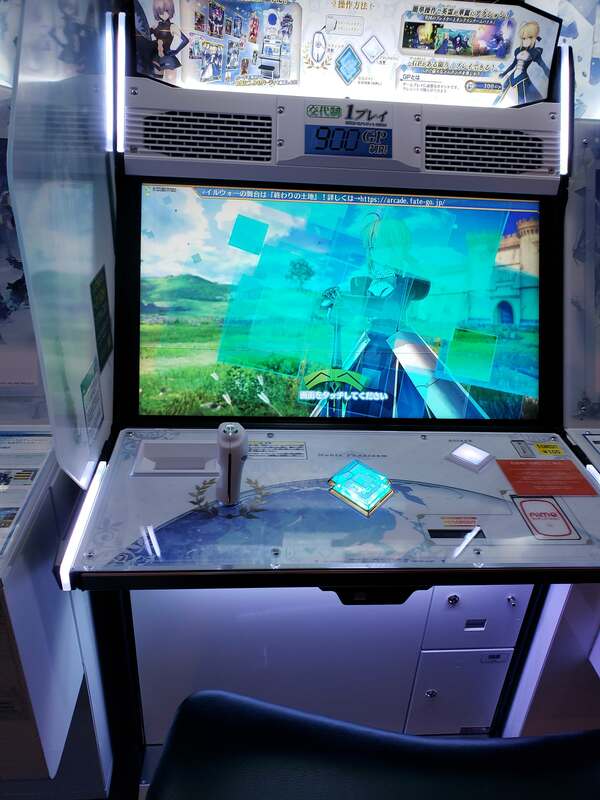 I'm not gonna lie, it took a while to get the hang of just how to play the darn thing, I prolly should've done my homework first but eventually we managed to get it working lol. Honestly the game itself was a lot of fun, just fighting and using the Servants in combat was quick paced and I kinda liked the counter and card system and how they managed to convert the turn based strategy into real time combat. But the biggest drawback was in just how expensive it was. I promised I wouldn't spend more than 2000 yen but I only got through 8000 before I just kinda gave up on it. Spending around 200 yen gives around 200-300 of the qp which is basically ap. And that stuff drains fast, to do a story mission it easily costs 200+ qp and with no extra for leveling up or playing it means that with the 800 yen I spent I couldn't even get through like the 4th Fuyuki mission. It's just too much and I feel sorry for anyone who truly enjoys the game as it was a lot of fun. Maybe one day they'll convert the system into an actual console game but I seriously doubt that would ever happen. Here is the haul I got by the end of the quick session that I had. I also got Mozart but uhh I think I left him in the arcade machine so he's lost to whoever was lucky enough to play after me. 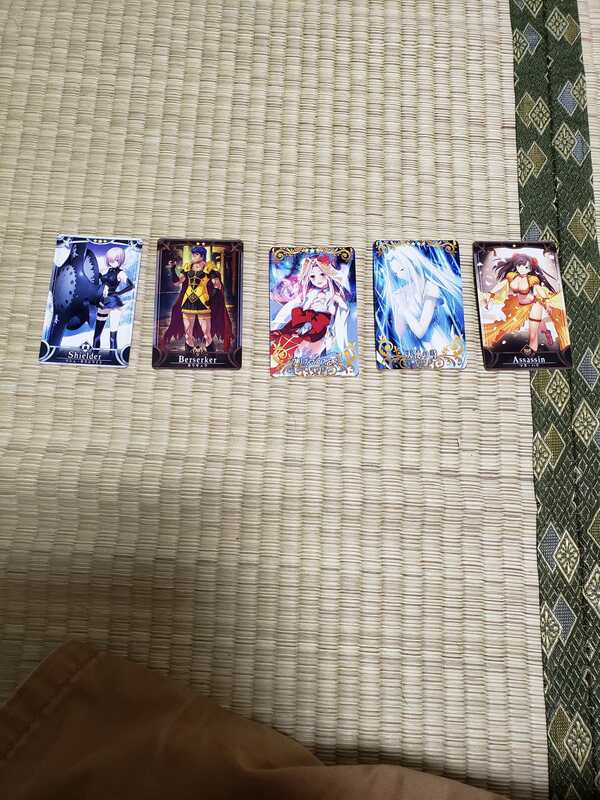 At the very least the physical cards are very nice so they will make for a good souvenir. I may try again if Medea gets released but I'm not going to sweat about it. Arash was right, that game is really just a cash grab. Besides the arcade we ate out at some places and got some ice cream but what was the most exciting thing for me was the book stores. 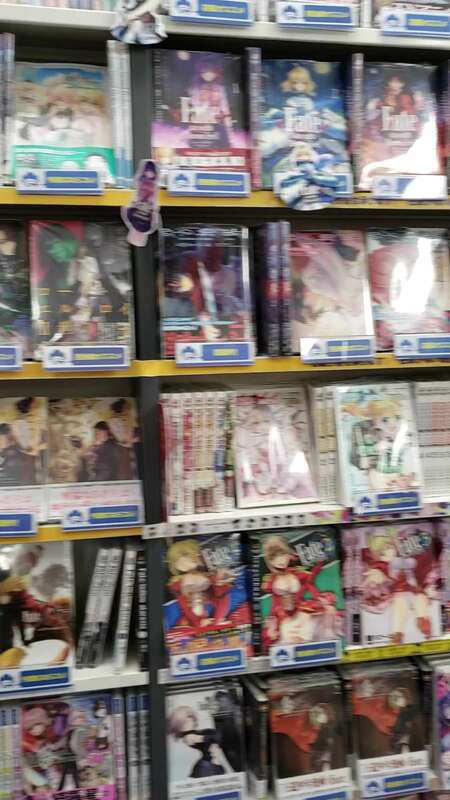 In particular the anime book stores that we managed to find. My only regret was that we went there right after the arcade and since we were there the whole day it meant I ended up carrying my haul with me the entire day. I apologize if it's a bit blurry but the place was rather crowded so that was the best I could do. 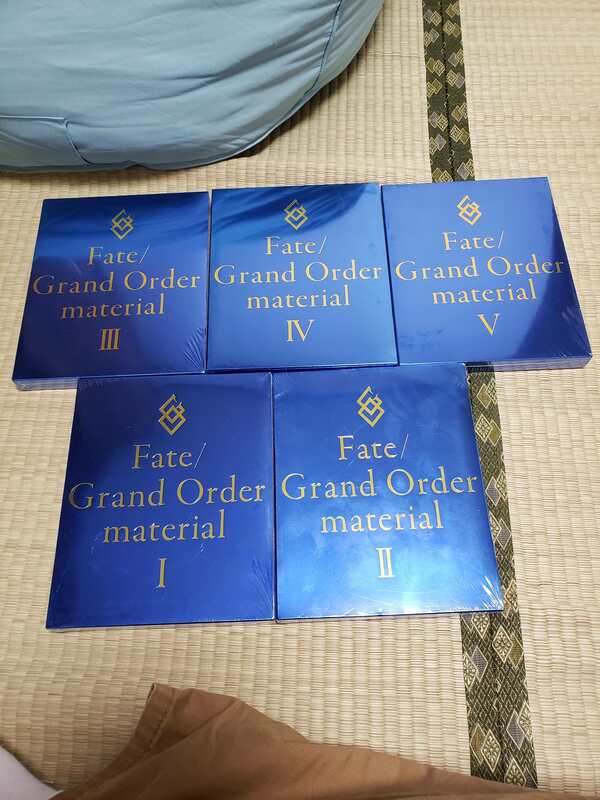 But imagine every single Type Moon book ever released put onto a single section of the store. It was quite memorizing that is for sure. They even had the Tsukihime manga! Despite only getting a few of them for now I will definitely come back there when I can, but for now, I think I will be having nothing but rice for a while. I went a bit overboard lol. Honestly I don't think my Japanese is that good so I may not be the best at understanding them but I look forward to practicing on them! The keychains will definitely be going on my backpack, gotta represent my two favorite Servants!. 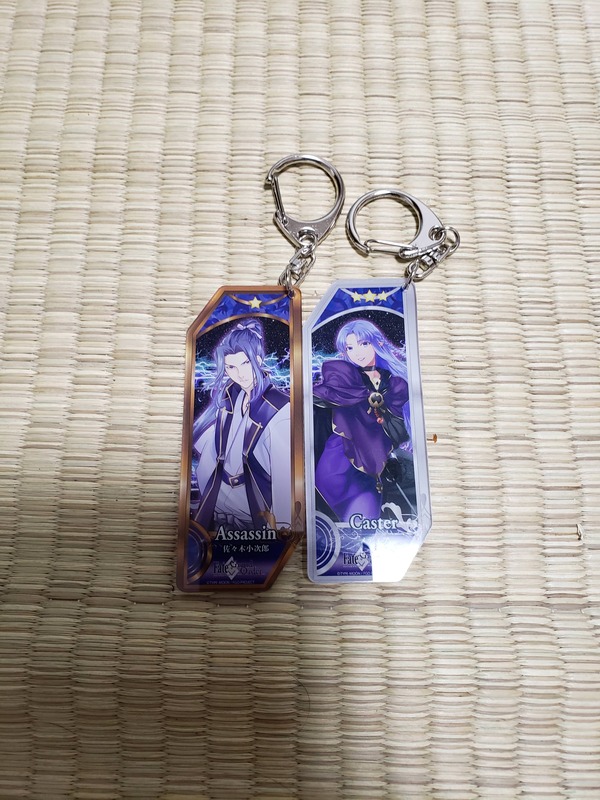 They had keychains for virtually every Servant released even newer ones but they were quite expensive so I settled on just the two best. 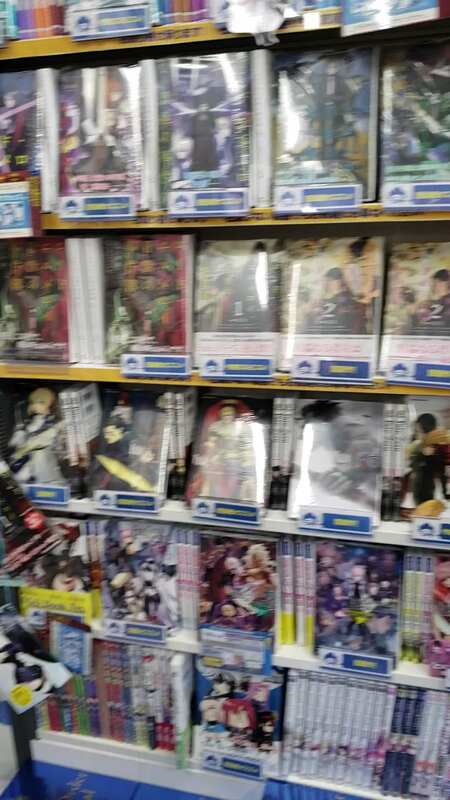 There was also a giant poster of the Fate/Zero rerun event with a giant Kayneth face that was pretty amazing but that was right next to the register and I didn't think it would be polite to take pictures of the staff as well. Besides, I'm not sure a picture would show just how amazing it was. Overall it was definitely a worthwhile day and I think that Sanomiya will be one of my favorite places to visit. I look forward to going back there in the future but for now I'll just take it easy. It's been quite the wild week. Unfortunately I don't have a scanner but if you want me to take any pictures of them I can do at least that much.